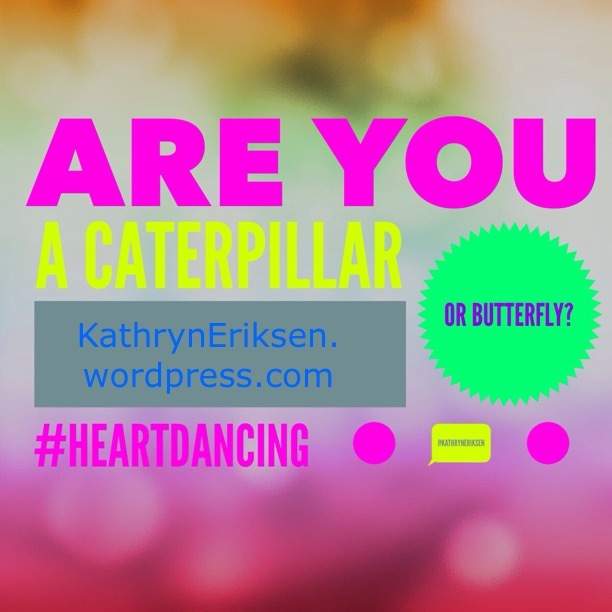 Are you a Caterpillar or a Butterfly? I have a new logo – did you notice it? I hesitated about using a butterfly, because it is one of the most common symbols of transformation and change. Think about it – a lowly caterpillar, inching its way up a tree trunk without much hope for a different life, is compelled to wrap itself inside a cocoon and sleep, only to emerge as a gorgeous creature…WHO CAN FLY! Unbelievable that both the caterpillar and the butterfly are really the same living being. They have to be – no one else got inside that cocoon, did they? Uhmmmm…I am starting to see the similarities between the caterpillar’s change and how we expand ourselves. Let’s look at the stages of growth and identify any parallels. Are we so different? We think we live in a world that directs, confines and limits us if we buy into its message. Happiness lies outside of us, in that new car or shiny object that promises fulfillment and satisfaction. Just like the caterpillar, we are one leaf away from happiness. We also have the potential to become something greater than ourselves. Until one day, an inner nudge (instinct) causes the caterpillar to shed its skin and create a cocoon. It probably doesn’t know why it is covering itself, but suddenly, the caterpillar’s only goal in life is to be encased inside a cocoon of its own making. What about you? Have you felt an inner nudge to start questioning the ways of the world? Do you feel dissatisfied in how your life has turned out? Are you seeking answers from within instead of from the outside? Then you are going into the cocoon stage. When you begin to question and search for answers, there is a period of time needed to digest and integrate the new information. The inside work of you begins to evolve and will soon make its presence known on the outside. Think of it as your own metamorphosis or transformation. Breaking open the cocoon, an adult butterfly emerges. Not a baby or infant, but a fully developed butterfly who can fly! Caterpillars are tied to the earth. Butterflies spread pollen by flying from one flower to another. After you shift your perspective and thoughts, a different you emerges to the outside world. Your friends and family may notice the change and ask about it. But will they notice your wings? Probably not, until you begin to use them. As you begin your own journey of self-awareness and love, you will discover your ability to fly. No longer confined by worldly limits, you heart begins dancing to a new life, created inside. Ahhhh…now the butterfly in my logo makes perfect sense! Welcome to another step in the Heart Dance.